The following is a Navy news release, but it does show that the Coast Guard’s recently revived capability for diving in the Arctic ice is definitely making a strong come back. Includes information about the Coast Guard’s Cold Water Ice Diving course. 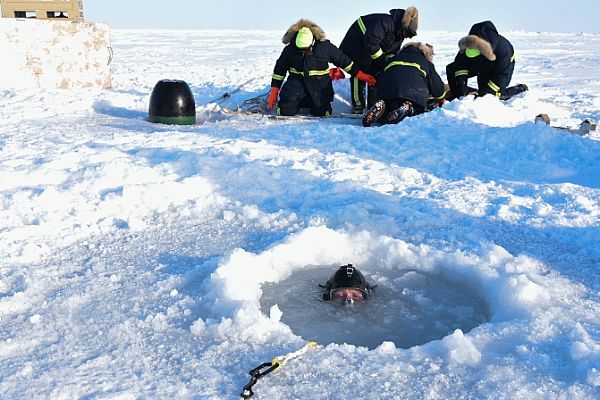 ARCTIC CIRCLE (NNS) — Divers from U.S. Navy Mobile Diving and Salvage Unit (MDSU) Two, Underwater Construction Team (UCT) One and the U.S. Coast Guard braved harsh Arctic waters to play a critical role during a torpedo exercise as part of Ice Exercise (ICEX) 2018. The USCG CWID course is a two-week course in Seattle, Washington hosted by the USCG instructors at Naval Diving and Salvage Training Center (NDSTC) which focuses on the use of equipment and diving operations in harsh Arctic waters. During the course, divers complete a diving practical in Loc de Roc, British Columbia at 5,000 ft. elevation to put environmental stresses on the divers and equipment to acclimate to the cold and altitude. MDSU-2 is an expeditionary mobile unit homeported at Joint Expeditionary Base Little Creek-Ft. Story (JEBLCFS) in Norfolk, Virginia. The unit deploys in support of diving and salvage operations and fleet exercises around the world. The primary mission is to direct highly-mobile, fully-trained and equipped mobile diving and salvage companies to perform combat harbor clearance, search and expeditionary salvage operations including diving, salvage, repair, assistance, and demolition in ports or harbors and at sea aboard Navy, Military Sealift Command, or commercial vessels of opportunity in wartime or peacetime. This entry was posted in Arctic, Cold Water Ice Diving by Chuck Hill. Bookmark the permalink.